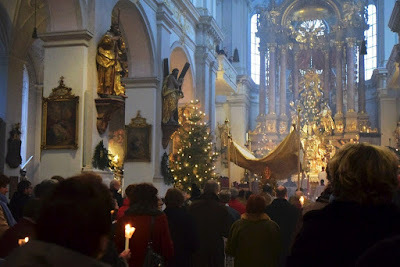 Thanks to reader Dawid Patryk Szmigielski for sending in these photos and description of the Epiphany celebrations at the church of St Peter in Munich, Germany. 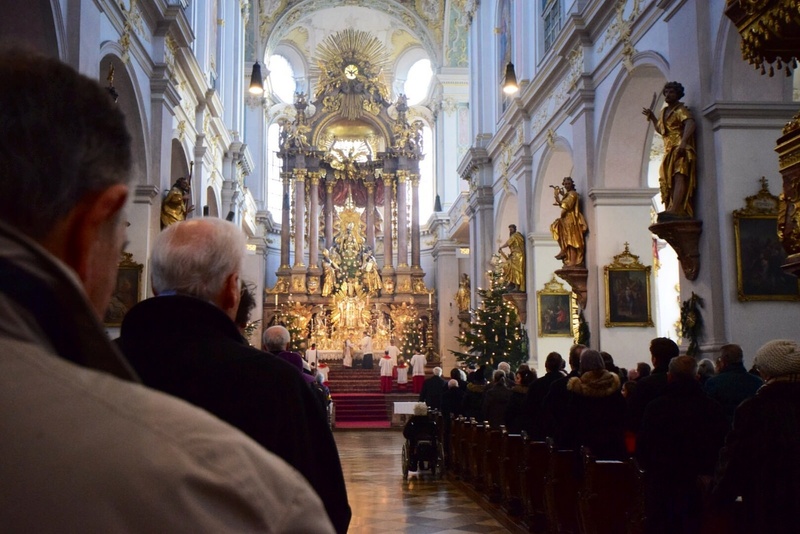 Epiphany was a packed day of liturgical celebrations at St Peter’s Parish in Munich, Germany. The parish is the mother of all parishes in the medieval center of the city, built is on the site of the original church where the monks from whom Munich gets its name evangelized and lived in the 8th century, on St. Peter’s Hill. Archbishop Gaenswein, secretary to Pope Benedict XVI, was parish priest here. 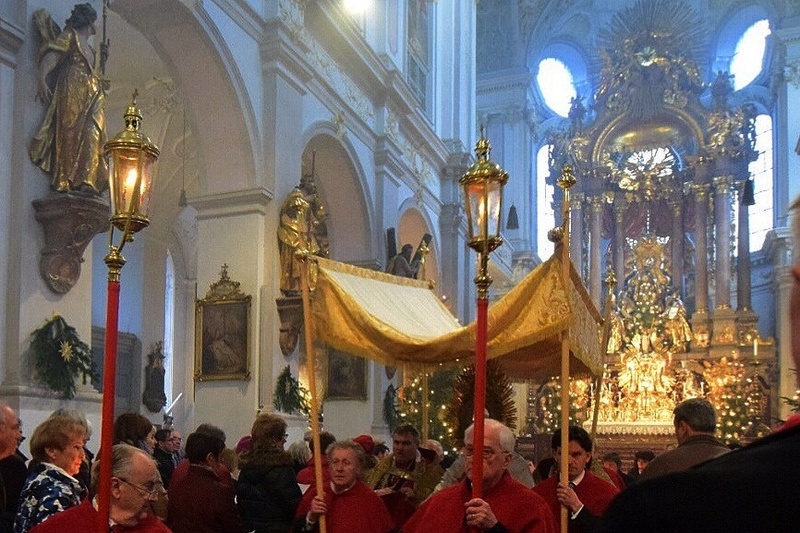 Then-Archbishop Ratzinger celebrated morning mass Thursdays, ad orientem, at the Corpus Christi side-altar. The parish is known for retaining the high altar without an additional freestanding altar in the sanctuary, and also for sacred music, art, liturgy, and a collection of relics, including the bejeweled skeletal remains of St. Munditia, a Roman martyr, exposed for all to venerate. The church is adjacent to City Hall and the Marianplatz Square, and minutes away from the Cathedral. 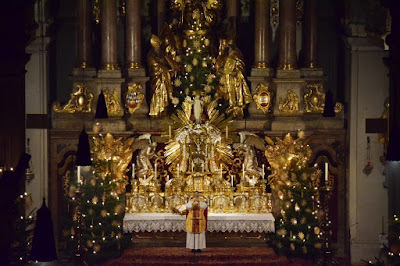 The 9:30 am weekly principal mass in the ordinary form, preceded by the Asperges, is said ad orientem in Latin, with the Liturgy of the Word in German. 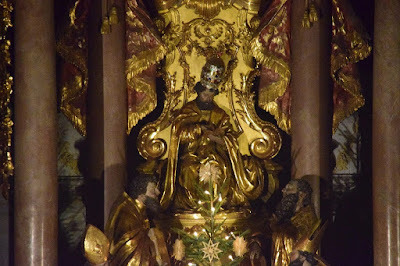 After Mass, the Blessed Sacrament is exposed in a monumental monstrance lowered mechanically from a niche above the tabernacle, below the Gothic and Baroque depiction of the Chair of St. Peter. The tiara atop St. Peter’s head is traditionally removed during an interregnum period, and crowned again upon the installation of the next successor of Peter. Tradition dictates that the Archbishop visit the parish every Epiphany. 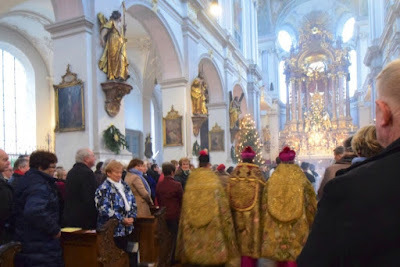 This is in part due to the parish being home to the Corpus Christi Brotherhood, which celebrates its high feast on the Epiphany, following the example of the Adoration of the Magi. 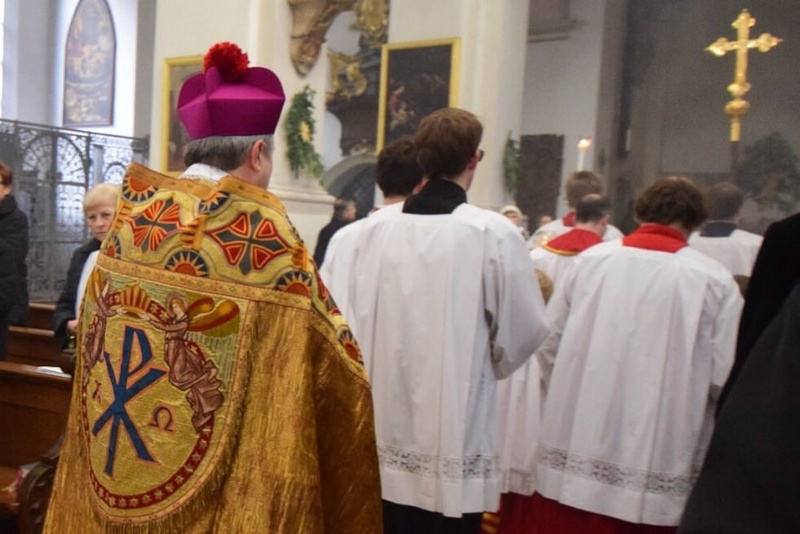 After the morning Masses, the Blessed Sacrament is exposed until 3pm, then temporarily reposed for a grand celebration of Vespers in Latin with the Archbishop. 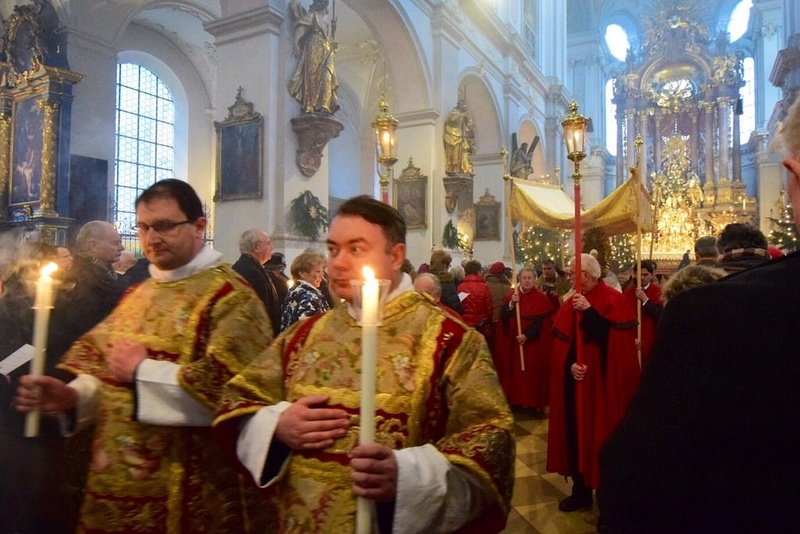 A Eucharistic procession through the church follows, with Benediction at the end. 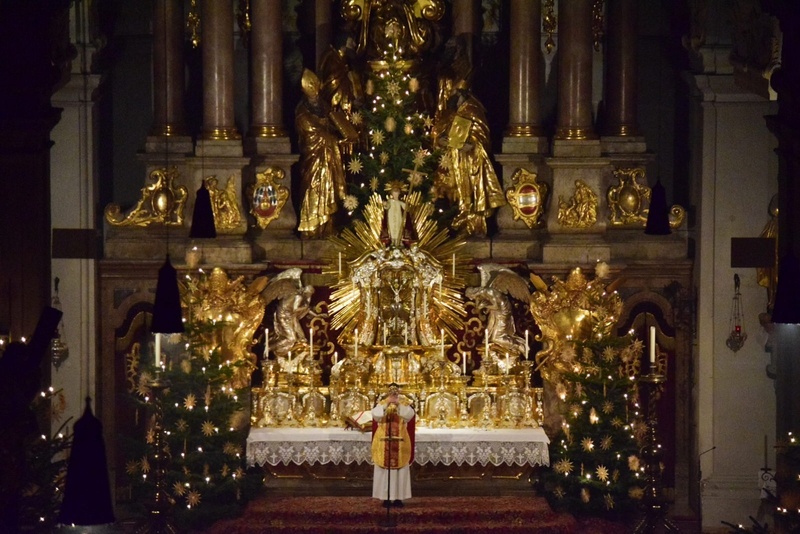 The last Mass of the day is at 6:30pm, with a blessing with the relics of the three magi as the final blessing. This year, unfortunately, His Eminence Cardinal Marx was unable to attend and was represented by the Vicar General of Munich and Freising. 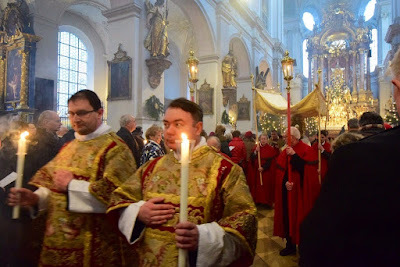 Notably, the Priestly Fraternity of St Peter, ministers in one of the parish’s affiliated churches, St. Anne’s Damenstiftskirche, in the Extraordinary Form. 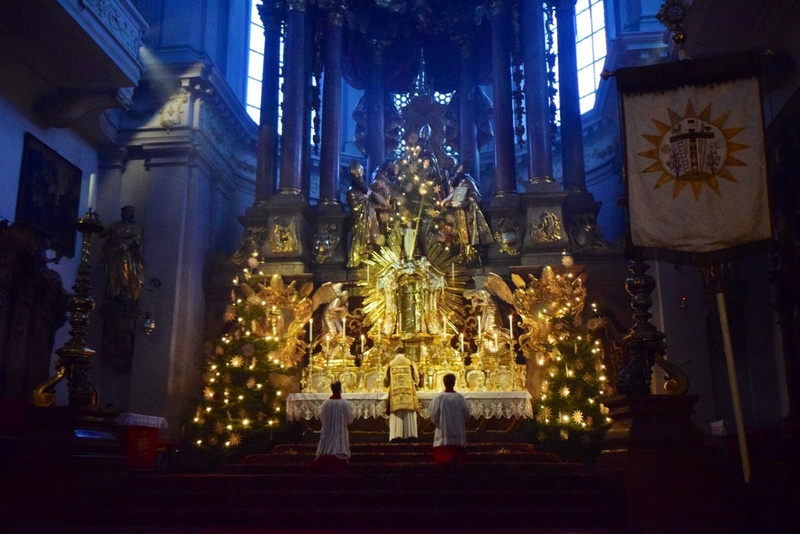 Mass at St. Peter’s in Munich is offered only in the Ordinary Form, ad orientem, by both diocesan and religious priests. His Holiness Pope Pius VI celebrated Pontifical High Mass here in 1782.